This could be the ideal option for the budget conscious, or space limited wedding reception. Prices include a small selection of our intelligent lighting and speakers, which we can change and adapt after speaking to you to make sure we bring something suitable for the event you have in mind. But mainly you will get an experienced DJ who can programme your event, guide your guests and make announcements, and handle even the most obscure of requests on the night so you can relax and enjoy the party. The perfect package for the perfect day. This provides an all day experience with music and even video where required for the full ceremony, and all other appropriate times throughout the day. This all leads up to the final evening reception disco in the evening. Free consultation, meetings, and even rehersals if required before the day. Full pre-ceremony and post-ceremony background music to help set the atmosphere. Full ceremony music, including signing of the register background music, hymns or songs if required, and your own personalised choice of entrance and exit music. Includes the use of discrete microphones to ensure all your guests who have come to share the moment with you can hear you sharing your vows, even in the back rows. Also includes wedding breakfast and/or cocktail hour background music to help maintain the spirit and atmosphere as the day progresses. 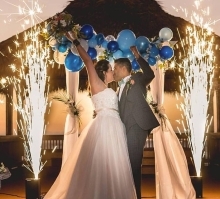 Custom entrance announcements, with tailored music intros specifically for all the different members of the bridal party, so all your closest family and friends can enter in style. Microphones and all the necessary equipment provided for speeches. We will communicate with your own photographer and videographer if you have one before all the key moments in the day to ensure they know what is coming so they don't miss a thing. Selfie-Wizard: This new photo gathering system is included free of charge for all full day wedding events. This allows your guests at any point during the meals, or evening reception to upload pictures that will be instantly displayed in a randomised slide slow on a screen, and will all be yours to keep on a USB memory stick at the end of the night. No need to chase people on social media the next morning! You can also opt for a live print service pack that will print your own personalised frame design round the edges in real time as the pictures come in, which can either be kept by your guests as a momento, or inserted into a custom guest book or picture album as the night goes on. Low haze and/or low lying fog atmospheric effects provided for use at key moments such as the first dance to create that dream like walking on clouds effect, and let your photographer capture some incredible and memorable photos. 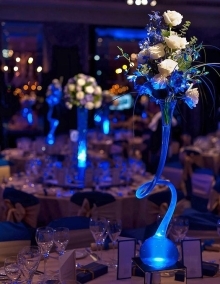 Full custom uplighting setup available to literally paint the room with light in your own chosen colour scheme, which later on can then be used to change dynamically with the beat of the music to enhance the disco effect. 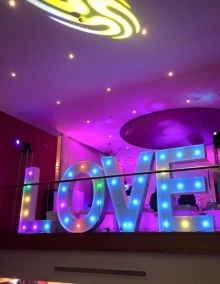 With the all day wedding you can also gain fantastic discounts and choices on all the other services we can offer such as illuminated LED LOVE letters (other letters and words such as 'MR & MRS', DANCE, or your own names also available). 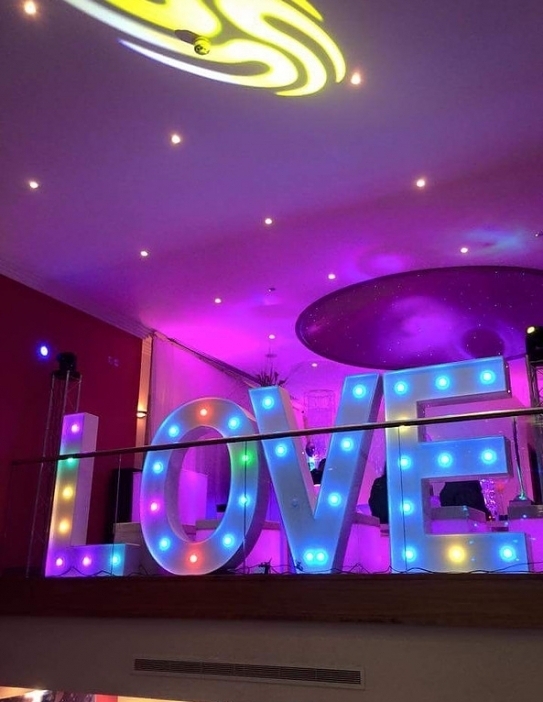 Discounted offerings on LED dancefloors, and even fully illuminated tables and stools! Discounted rental of new indoor-safe 'Sparkular' cold spark fountains for a real wow factor. this is the difference good uplighting can make! Also included in the all day wedding is the fantastic love story introduction. 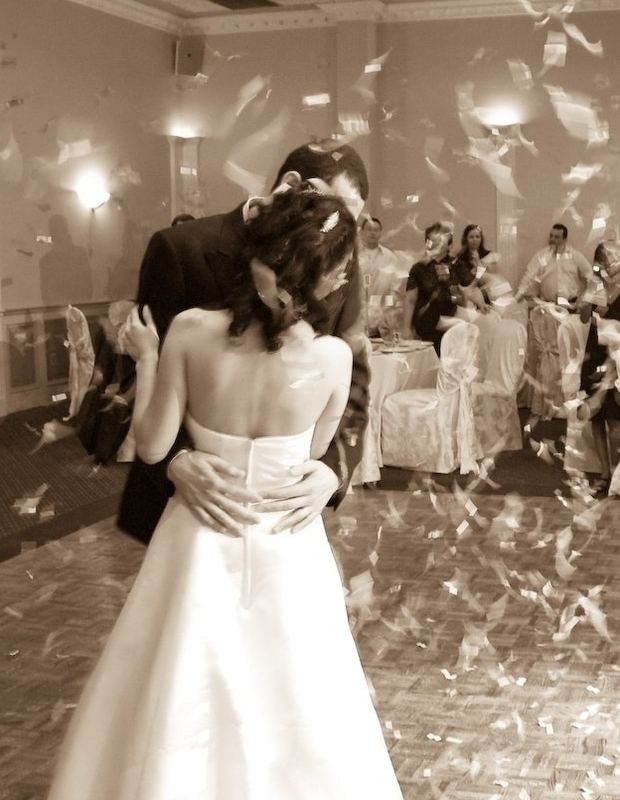 If you have never seen it, it is a simple but extremely effective use of the DJ telling your story from how you met, fell in love, and celebrated time together and more, just moments before you make your grand entrance, or alternatively can be used as a precursor to your first dance. This can really help create a strong sense of occasion and at times you might have to look twice to see a dry eye in the room as it can really help your guests feel like a part of your story.